Everyone knows and loves the Pikes peak international hill climb, What used to be a gas fueled day of oil burning super engines. 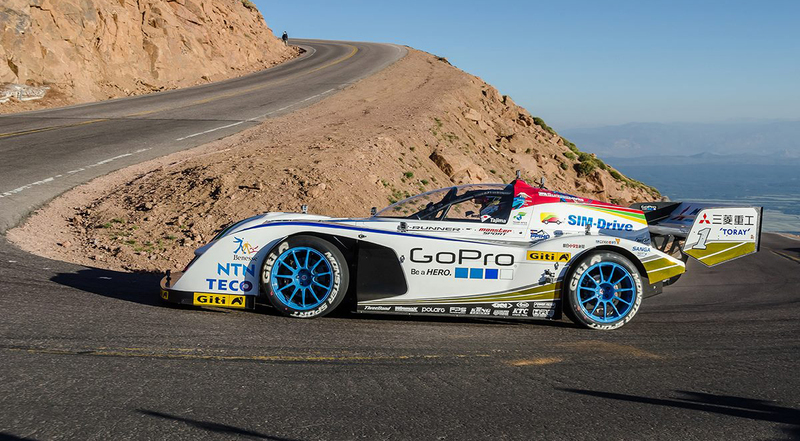 Has become a race more centered around electric powered beasts ripping up the mountain. The interesting part about the electric division is that they aren't aloud to make many modifications to their cars. Electric cars are starting to be seen more and more due to the instant power you are able to get in and out of turns and straight away. As the benefit of running an Electric Vehicle can be stupendous, but the risk as always is substantial. One car we can site from history would be international race legend “Monster” Tajima whom runs an Electric Vehicle called the Rimac eRunner, This car has a whooping 1,475 horsepower and 1,100 lb-ft of torque, which shoots the almost weightless 3,300 pounds of car at a top speed of 221 Mph, with a 310 mile charge distance. Other competitors that run electric cars include Rhys Millen that runs the 2016 eO PP100 with a top speed of 161 Mph. Rhys won the 2015 PPIHC in this car. Tetsuya Yamano also competes in the EV division with his 2016 4-motor EV concept, modeled after the beautiful Acura NSX making this car a crowd favorite due to its famous following. This one of kind car has 1,350hp giving him the easy 3rd place in the overall standings in 2016. The last competitor brave enough to rough the mountain in one of these all electric cars is Rick Knoop driving a 2015 Entropy racing EVSR, this car has a 30-40 minute run time and only weights 2000 pounds and has 175 Hp and 180lbs of torque with 140 mph top speed. These men run through the 12.42 Mile course with 156 turns, with an average grade of 7%, also having 10 high danger areas on the track. All these men finish with times from 8:57.118 with the 2nd overall ( Rhys Millen) to 15:02.413 and 76th overall ( Rick Knoop). Overall the Pikes peak international hill climb has continued to bring racers and fans from all of the world together to enjoy 3 days of fun in the sun right here in our beautiful town of Colorado Springs.